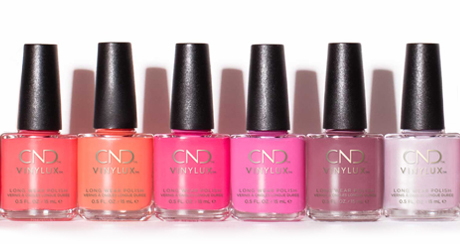 CND™ VINYLUX™ Long Wear Polish delivers week long wear—and care—in two simple steps. Choose from more than 100 high performing shades and reinvent yourself weekly. Base and color coat in one step, high impact color that lasts and available in more than 100 fashion-forward colors! Fully dry in 8 ½ minutes featuring brilliant shine that lasts. Top Coat that adds a special effect finish to any CND™ VINYLUX™ shade: Matte, Glitter, Pearl.